James le Palmer (d. 1375) was a London Clerk who, as he tells us in the introduction, consulted over one hundred different texts in compiling this vast encyclopaedia of canon law, theology, and general information. James wrote the book himself, which was a huge undertaking: in its present, unfinished form (the encyclopaedia runs out of steam after the letter 'M'), the text runs to well over two thousand large pages, decorated with more than eight hundred illustrations. 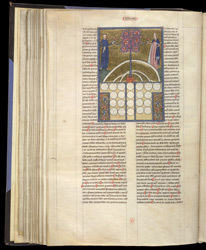 A Tree of Affinity was a common medieval means of representing in diagrammatic form relationships by marriage (as opposed to blood relationships, which were represented by a Tree of Consanguinity). This is a simplified version of the usual Tree, and the roundels have not been filled in.